A year after missing out on the Stanley Cup Playoffs on the final day of the season, the Carolina Hurricanes took a step backward in 2011-12. The Canes slumped at the start of the season, costing coach Paul Maurice his job. Carolina improved under new coach Kirk Muller, but it was too late for a comeback, and the Hurricanes missed the playoffs for the fifth time in six seasons. General manager Jim Rutherford went on the record with his desire to add a marquee player (or two) this offseason, and he landed one in a trade on the first day of the 2012 NHL Draft by bringing in Jordan Staal from the Pittsburgh Penguins. Under-valued: Eric Staal – Last season’s 24 goals were his lowest since his rookie season (11), but with plenty of new help on offense, Eric should be an early second-round draft pick this season with hopes of returning to his 35-plus-goal-scoring ways. Over-valued: Cam Ward - Ward is drafted and expected to be an elite goalie every year, but a career 2.74 GAA and .910 SV% points to disappointment. Expect around 35 wins and a handful of shutouts, but key goalie stats won’t be what you want. 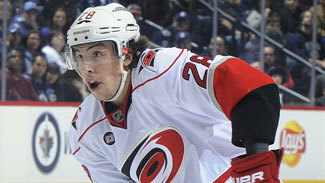 Sleeper: Justin Faulk – Despite a minus-16 last year, the 20-year-old offensive-minded blueliner posted eight goals and 22 points in 66 games. At the 2012 World Championship, Faulk led Team USA defensemen with eight points in eight games and could emerge as a dominant fantasy d-man this season. Rutherford also tried to lure the top free agents to Carolina, and eventually added another top-six forward on a big money, one-year deal. Staal and Alexander Semin give Muller a lot more firepower, and adding Joe Corvo and possibly stud prospect Ryan Murphy on defense could give the team a chance to compete for the Southeast Division title. NOTES: One of the first decisions for Muller is where to play his newest Staal brother. Jordan Staal could be the team's top-line center, pushing big brother Eric to the wing. That would likely make Ruutu or Skinner the No. 2 center. The other option is to play both Staals at center, leaving Skinner on the wing and Ruutu as either another top-six wing or the No. 3 center. Semin played right wing for years with the Washington Capitals, but that was initially done to keep him and pal Alex Ovechkin from waiting for each other to come back to the bench for line changes. Semin could slide back to the left side. This could be a big year for Dalpe -- though he needs to hold off a few other prospects, namely Jeremy Welsh, Zach Boychuk and Drayson Bowman, to even earn a full-time role. Stewart had better offensive numbers than the other players on that projected fourth line, but offense isn't likely to be a problem for the Hurricanes. Faulk played with Harrison near the end of last season, but with Bryan Allen departing he could fit well with Pitkanen or Gleason. Corvo had success with Carolina before, so a return to a comfortable setting could be the elixir after a rocky year with the Boston Bruins. He was a low-risk signing at the price, and adding Gragnani as insurance could prove a sage move. One to watch in camp is Murphy, who could force his way into the team's immediate plans. Ward is a workhorse, and with expected backup Brian Boucher out to start the season, expect him to be in net a lot. The Hurricanes need Peters to gain Muller's trust -- Ward has had some crazy workloads in recent years, and getting him some rest before Boucher returns would be helpful if the Hurricanes can return to the postseason.